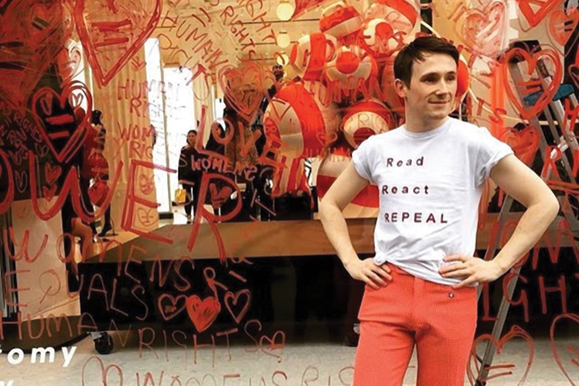 An Irish fashion designer took over a shop window in London’s high-end Selfridges’ department store to protest Ireland’s 8th Amendment, which prohibits abortion, in support of the referendum vote scheduled to take place on May 25 on whether to repeal the amendment. Richard Malone, a County Wexford native known for his eco-conscious designs and who has been written up by the likes of Vogue and the Museum of Modern Art, was set to hold a 24-hour pop-up window in the Oxford Street store in April describing his own personal definition of luxury as part of Selfridges’ “Anatomy of Luxury” campaign, curated by London-based designer Gareth Pugh. Such love and creativity on behalf of the killing of babies! Yay! The above article reminds me of my visit to St. Agnes Church near Grand Central Station, NYC, in mid-January, 1993. I was accompanied by my future wife, who had become the widow of a Bronx Presbyterian minister the previous year. In the vestibule of the church, she signed her name in a book, and I asked if that was the visitors’ book. She answered, “No. this book if for Pro-Life signatures”..